I get frustrated when I need to quickly see a calendar with the current month and I have to fumble around opening the BlackBerry calendar and switching back and forth between applications. Wouldn't it be neat to have a calendar right on your home screen so you can easily view it? Now you can have just that. MMMOOO has developed an application called Calendar Wallpaper that pushes the current month's calendar right to your home screen. You can customize it with different colors for weekends, current day, current week, and general color. You can also choose to have a solid color background or use an image on your device, and if you're the type that likes to plan ahead, you can choose to show two months instead of one. I like this app and think it's useful, however there are a few additions I would like to see in future updates. For example, if you frequently switch wallpapers, you may not want to use Calendar Wallpaper unless you plan on changing them manually from within the app. It would also be great to be able to choose where on your screen the calendar appears. As it is now, there is only the one option. This could overlap other elements on your home screen, depending on what theme you are using. These are only minor issues however, and easy to work around, if they affect you at all. 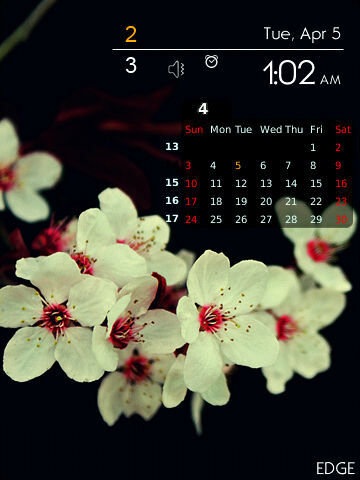 Calendar Wallpaper is just $.99 and available for BlackBerry 8330/50i, 85xx, 89xx, 9000, 91xx, 93xx, 95xx, 96xx, 97xx, and 9800. There is also a free trial available, so you can check it out before you purchase.